Accomplished and driven, Estella has written two children books, attended the Academy of Dramatic Arts for theatre, and worked for over ten years in corporate America. She possesses a passionate interest in education which led her to the TEAK Fellowship, a mentoring program that sponsors gifted children from inner-city low income families for gaining admission to demanding top tier high schools followed by accelerated college programs. She was, in fact, presented with the TEAK Fellowship Volunteer of the Year Award (1996). Estella’s interest in restaurants and cooking was mentored by her father, a New York chef for 30 years. He inspired a love for cooking by taking Estella to La Marqueta, the farmers’ market along Spanish Harlem’s East 116th Street. For their family’s Sunday dinner, Estella and her father shopped the market for the finest in fresh ingredients, all the while harvesting fresh vegetables from their backyard—a simple patch he transformed into a thriving brownstone garden. Raised on a farm, he instilled in her a regard for agriculture with many of his table conversations emphasizing a respect for freshness, the vital role of vegetables, and the importance of family traditions surrounding the table. Estella’s vision naturally evolved, and sharing her father’s enthusiasm for great food prepared and served at home, she decided to follow her dream: to one day own her own restaurant. Estella’s big idea came into fruition when she and future husband and business partner Dennis Foy joined forces in 1994 to establish Restaurant EQ on West Fourth and Perry Streets in New York’s charming West Village. This dynamic pairing--he’s the chef, and she manages everything else--was twice recognized for Best Restaurant-New York City (1996) with EQ, and again for their Tribeca restaurant Dennis Foy, by GQ magazine (2007). After the stylish Dennis Foy restaurant in Tribeca, the team took on New Jersey, with popular spots at Point Pleasant Beach, Bay Head and Lawrenceville. In 2012, seeking the next perfect location, Estella looked west, setting her sights on charming Lambertville, across the Delaware River from bucolic Bucks County. D’Floret restaurant is located in the Lambertville House on Bridge Street and proved to be an ideal culinary creation to manage as Estella sees to the daily front operation and waitstaff. Moreover, as interior designer, Estella has counter-balanced the intimate and cheerful space by integrating Chef Foy’s large colorful paintings in this seasonally-inspired, intimate restaurant. Now Estella and Dennis return to the Jersey Shore as they open their next masterpiece in Red Bank. 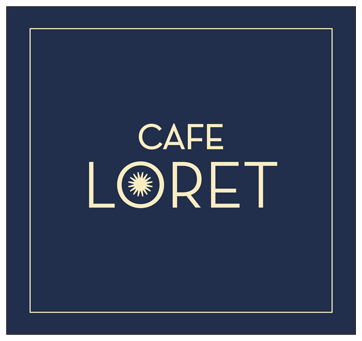 Café Loret is a 66-seat indoor space with additional patio dining, and is exactly the challenge Estella naturally pursues. After all, the idea of another restaurant simply complements the partners’ aesthetic concept, that of a local, organic, sustainable farm to table driven menu that they may now present in Monmouth County. And remembering her father’s words, Estella truly knows she is easily at home as fans and followers gather around one of her tables to enjoy the best with friends and family.